My brother, provider of magical roasted green chiles, passed through town yesterday and brought little container of them. If there had been more I would have made that queso fundido again, but under the circumstances we just tossed them into our breakfast. 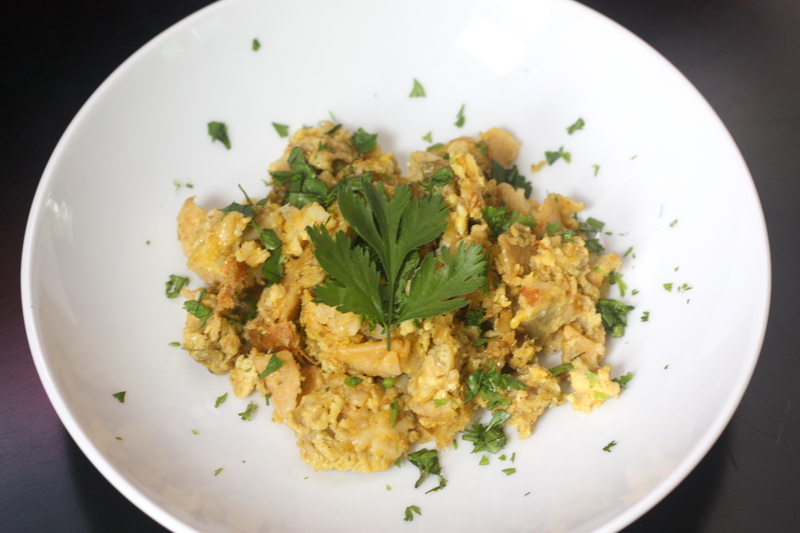 I love how just a little bit of an excellent ingredient can elevate an ordinary dish like scrambled eggs. I know that the world has accepted scrambled eggs with truffles or caviar as luxury food. I submit that roasted green chiles belong in the same category. Eggs with Chiles, Chips and Cheese: Chop a handful of roasted green chiles (lucky you if you have a New Mexican variety; otherwise a roasted and seeded poblano will do). Grate some cheese and have a bag of tortilla chips nearby. Whisk eggs with the chopped chiles, salt and pepper, and a splash of water, and begin to scramble them according to your favorite method. (Do you know that Julia Child dumped them in a pan over low heat and then ignored them for three minutes? I could never do that.) When the eggs are nearly set, crush a big handful of tortilla chips into the pan and stir in the grated cheese. When the eggs are cooked to your liking, serve topped with chopped cilantro. It’s totally in the same category as truffled scrambled eggs! You must ask your brother his method the magical roasted chiles and share! I love any kind of egg dish, and this one looks grand! This is one of my favorites. Looks great, Emmy! Eggs and fun all on a single plate! This looks a great breakfast idea. Wait. Why don’t I have any roasted green chilies around? Lovely idea – maybe they’ll make my kids like scrambled eggs. If not, they’re all for me! Beautiful post! I am all about adding eggs to the meal whenever possible. This morning, a Goat Cheese and Chard Strata! Please have some for me…I think I’m off eggs but still waiting for definitive results from a food sensitivity test!